Back in about 1998 I decided to build a proper treehouse to live in. A lot of this information comes from my website back in the early 2000’s when I documented the build process, and I’m going to fill in some additional notes as I go along. The story begins with a 16 year old me learning to fly planes. Flying planes was so freeing and an incredibly beautiful experience. I loved seeing the world from the sky and thinking about the places that a plane could take me. I was just 17 when I took a Diamond DA20 “Katana” and flew my girlfriend over 300 miles from Watsonville airport to the island of Catalina for a day trip. I had decided that I wanted to become a professional airline pilot, and the best way to do that was to attend the best school for learning to fly. That was, and still is, Embry-Riddle Aeronautical University (ERAU). I went to ERAU in Prescott, Arizona after high school hoped to get a BS in Aeronautical Science and eventually land a job as an airline pilot. My thought was that I would eventually work my way up the ranks and could earn a good living while working minimal hours and get the benefit of traveling the world for free. Initially I wanted to attend their campus located in Daytona Beach, Florida, but the distance was a bit too far from my home base of Santa Cruz, California. Prescott was close enough to drive to in a day, and I met a friend named Frank Siri who was also going to go there at the same time. So, I went and learned to fly. After two years, I had attained my commercial, multi-engine, and instrument license. The next step was to become a flight instructor and build up hours. I never quite fit into the pilot scene; a lot of the people were clean cut individuals, and I had shaggy hair topped off with a goatee. I was also spending a tremendous amount of time on my own playing with computers and teaching myself to program. Initially, flying planes was challenging and interesting, as I got to learn all these new dials and gadgets and control a vehicle in a three dimensional space. But that initial challenge wore off once I mastered the basics, and I was starting to get board. I became more interested in the challenge of programming. Programming seemed to have limitless things for me to learn, and I could control the software to do things that I wanted it to do. These challenges and ability to make it do stuff was fascinating to me. After my sophomore year of college I dropped out and moved back home with the intent of studying computer science. I had hoped to directly transfer to UCSC, as it was the closest university to where my parents lived, but I had to do an extra middle year at Cabrillo College to earn appropriate transfer credits for the major. I wasn’t too happy with this, as it caused my college time to take a a full extra year, but I didn’t have much of a choice. But what does this have to do with the treehouse? I moved back home and I didn’t really want to live with my parents. At this time it was really just my dad, as my mom had moved back to Maui and my dad was eventually going to follow when the time was right. I was okay with living in my old first treehouse, but it severely leaked water in the winter and wasn’t habitable for months at a time. The obvious solution was to build a newer, better treehouse on top of the old treehouse and live in it. I called it the “second story”, even though it was a completely separate structure. One of the first things I did was to create a floor plan. I used Adobe Illustrator to layout the basic pattern. The first step was to measure the circumference of the trees using a piece of rope and then calculating the diameter of them from that. I then did a rough distance from each tree and laid it out in Illustrator. I could then drop down some beam length positions mainly based around the standard 4’x8’ plywood sheets. What I did was to use lag bolts to attach 2×10 or 2×12 beams to the tree. In hindsight, this was a bad idea, but there weren’t many options back in those days and my engineering skills at 20 years old were based primarily on intuition instead of experience. 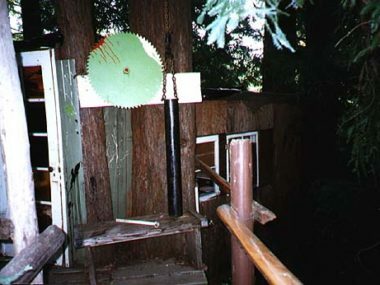 The invention of the Treehouse Attachment Bolt (TAB) came to light around this time by some much more skilled treehouse inventors. 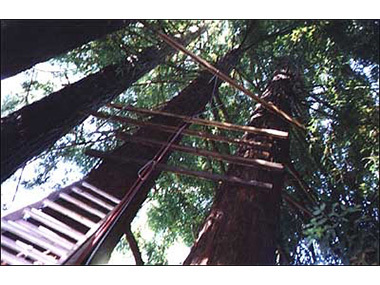 I knew that permanently attaching the each end of a beam to separate trees would eventually cause failure, as each tree would move at a different rate and effectively pull the treehouse apart over time or in high winds. This did happen, and it took 10 years before the treehouse fell down. Don’t follow this type of design! I present it here as a historical means of what I did as a bad design. Instead, use TABs and float one end on them. Also, use much larger beams! 2×12’s were not thick enough, and something much beefier should have been used.